Making this meal won't take much time, but it will take up some space on your stove -- you’ve got the grits going in one pan, you’re frying eggs in another, and using a third pan to cook the sausage and greens. But trust me, it’s worth having to clean a few dirty dishes. Bring milk to a boil in a medium saucepan. Slowly stir in the grits. Cover the pan and reduce heat to low and simmer for 5-6 minutes, stirring occasionally. Add grated cheese and stir grits until cheese has melted into the grits. Cover and remove from heat. 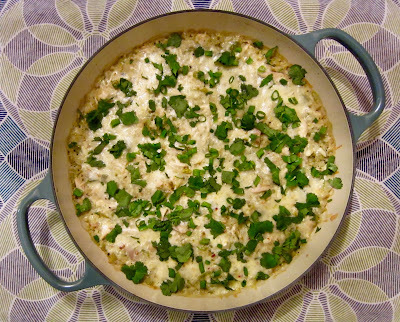 While grits are cooking, heat 1 tablespoon olive oil over medium heat in a frying pan or skillet. Add sausage and cook until browned, 4-6 minutes. Use a slotted spoon to transfer sausage from pan to a plate. Heat remaining tablespoon olive oil in same frying pan over medium heat. Add garlic and sauté for a minute, until fragrant. Add collard greens, chicken broth and red pepper flakes. Cook greens, stirring occasionally, for about 5 minutes, until greens are just wilted but still bright green. Just before serving, melt butter over medium heat in a large nonstick pan. Crack eggs into the hot pan and cook until the eggs have reached desired consistency. I cooked mine for 3 minutes, until the whites were set but the yolks were still runny. Divide grits among four bowls. 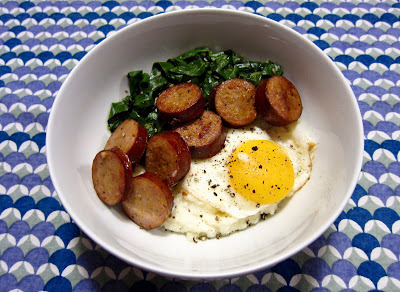 Top each bowl with greens, sausage and a fried egg. Season with salt, pepper and Tabasco sauce as desired. 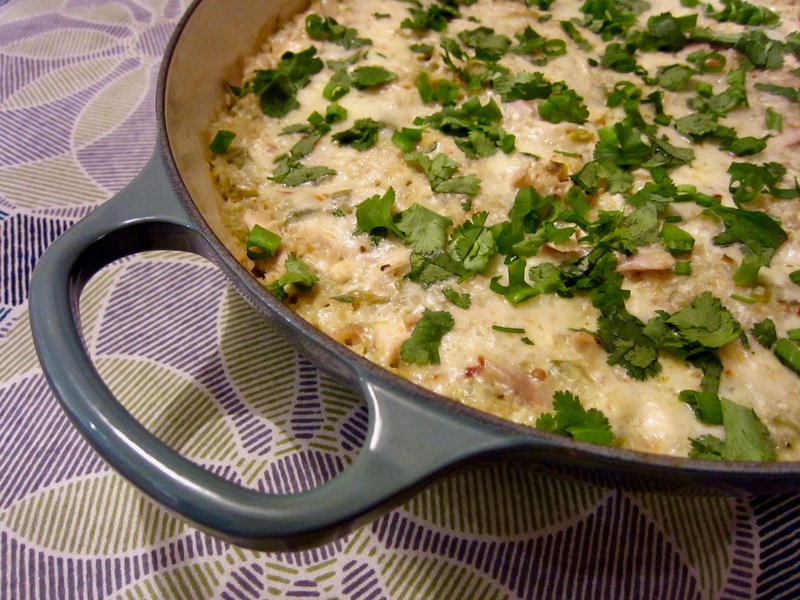 The next time you feel like cooking a cozy dinner without spending too much time in the kitchen, give this delicious casserole a try. 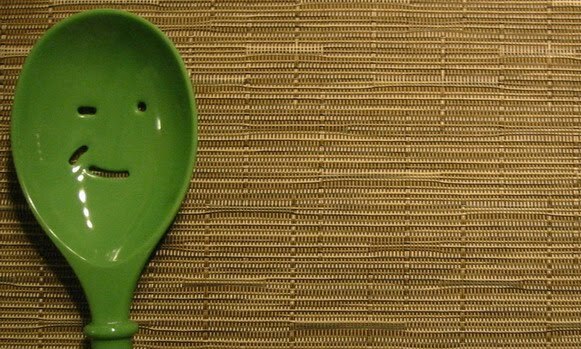 Use an oven-proof skillet or frying pan if you’ve got one to save yourself some time when cleaning up! Bring water and bulgur to a boil in a pot. Reduce heat, cover and simmer for 12-15 minutes or until tender. Drain off any extra liquid. While bulgur is cooking, combine combine chicken, salsa and chiles and in a skillet or frying pan. Warm the chicken mixture up over medium heat. Stir in cooked bulgur until everything is mixed. Remove from heat and transfer mixture to an ovenproof dish if needed. Top with shredded cheese, cover with aluminum foil or an oven-proof lid, and bake for 20 minutes. Remove dish from oven, top with garnishes, and serve.